Reiterating the story of all doctors working in government hospitals, the resident doctors of one of the most prestigious institutions of the country, AIIMS, New Delhi, approached the dean on friday, last week, asking for a much needed respite. Their demand was not very uncommon, or for that matter, not very unlawful. 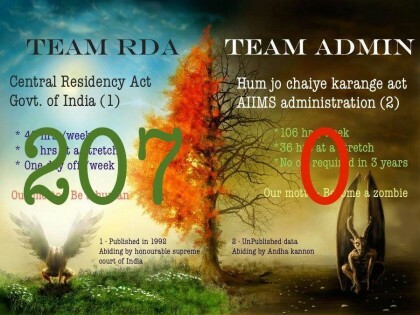 The RDA AIIMS demanded the imposition of the government`s central residency scheme at the institute, quoting that as per the guidelines set by the government, continuous resident duty hours for patient care should not exceed more than 12 hours at a stretch. Currently, however most of the residents are said to work 36 hours at a stretch every alternate day. The long working hours have become a necessary evil for the current resident doctors, who following traditions are slogging long and late hours, sometimes amounting to over 100 hours a week ( as opposed to the guidelines of 48 hours a week). According to Dr Tarun Arora, President, RDA AIIMS, this causes a number of times for doctors to compromise on patient care. ” Some doctors suffer from irritative behavior due to chronic sleep deprivation, which leads to poor patient-doctor relationship. Guidelines clearly state one day off in a week. However, most of the times the junior doctors have to work for months without a single day break. Junior doctors working in such exhaustive environments often become target to various diseases, most common of which is tuberculosis” he said. He also pointed out the human errors and rising negligence cases against doctors, whose only fault is that they are overworked. The systems of these long and harsh duty hours, were set a long time ago, and it feels that many of the senior doctors are against any changes to the existing system, a system which probably they went through, when they were residents. It is believed by some that the existing system is better and one that is preferred by the residents. Rumour has it that the authorities have given a chance to the resident doctors of AIIMS to decide their own verdict. If majority vote for a change in the system as well as towards the implementation guidelines of the Central Residency Scheme, then that shall be the verdict. The RDA, AIIMS has already began working towards their new goal.Today, Resident Doctors held a general body meeting, which was attended by 207 resident doctors from all departments. A secret ballot voting was done to take feedback from residents about the central residency scheme. Hundred percent resident doctors unanimously voted for the central residency scheme to be implemented as mentioned in the act. Resident doctor association has now started a signature campaign where residents are filling the declaration form with their signature to be submitted to the dean and various heads of departments. This will continue for three days and all forms will be submitted on this Saturday to the dean, AIIMS. If actions of today are any hint, then the verdict of the resident doctors is clear. Now only time will tell whether this turns into a new change in system or not.With almost 1500 resident doctors working at AIIMS, New Delhi, the institute implementing this scheme shall be a presiding guideline to all government hospitals across the country.